Last Cigar of the Year (A sad and weepy story with a happy ending). My wife DJ and I spent the last few hours of 2003 at a friend's New Year's party (many thanks to Rick, Brenda and Dark William for a great time). We ended the year playing Dalmudi (don't ask) on the patio so about half of us took advantage to spark up smokes. For my last/first smoke of the year, I had picked out a gifted Cuban H Upmann Monarch. Sadly, the first puff drew my attention for all the wrong reasons. The wrapper was good (but none of the glorious green spots I so love on Cuban smokes), the construction firm. The draw was good, as was the burn and ash. But the taste was exactly wrong for a Cuban. The flavors were okay but there was no You're Smoking A Cuban bite. There was no spice at all and there was a slightly muddy earth that I have only tasted in one other "Cuban" -- a maduro Cubans H Upmann Limited Edition that I was also given by a friend and which I am also certain was a fake. There was the earth and leather, some tobacco and pretty much nothing else. DJ described it as "totally unmemorable." My guess, from the quality of the earth, is that it was Nicaraguan (tho' I normally like Nicaraguans far more). Now I am told that the Monarch is not commonly counterfeited but either this was the second worst (and by far most non traditional) Cuban I've ever had or it was a fake. The band was perfect and I don't have enough experience with the Monarchs to make a call on the tube, but it looked good. But the appearance and taste were completely non-Cuban. Far less so that an apparently legitimate Montecristo #2 I once had that tasted only of straw. The wrapper was immaculate, with a touch of oil even after a few years (I think this was from her first overseas order). The aroma was characteristically mild but with hints of the Island spice so pleasing to the nose. It fired perfectly from just a touch of the lighter and gave forth tons of rich aroma smoke. The draw was letter perfect, just enough to let you know that it was there ... if you looked for it. The burn was razor-straight and the ash a beautiful Island black-grey, firm enough to hold to an inch or more every time. The flavors were wonderful, mellow but full, with hints of Cubanesque bite through the well-blended mix. It had strong leathery qualities with some Cuban spice and was very clean in taste thought the strongest flavors didn't kick in until the very end. There was also a nutty creaminess that I can't describe more fully. The aroma was pleasing, with spice and more of that creamy nut, but not as good as the flavors. Thank you, my wife. DJ is the light of my life and I would love her more than I could say even if she didn't give me cigars. Punch Black Prince: Well written, but content is not desirable. I do not want to read about someone's interaction with counterfeit cigars, especially on a site that is selling them. Readers will associate counterfeit with C.Gars ltd.
A some what boring review. There was to much background info about a smoke that shouldn't have been included. If you taken out the beginning three paragraphs of useless info then this review might have been a little better. There was no rating on the cigar being reviewed and lack some descriptions. Though a nice story, not a review in my opinion. I would rate this a 6/10 with potential of being a nice review. It was a beautiful early summer night and I was dying to sample my first example of this fine vitola with serious age on it. One rarely sees this cigar with 10 years of reputable aging and I was lucky indeed to have successfully bid on this cabinet at the Christies May auction in Geneva. I sat on my deck under a nearly full moon, gazing at the light shimmering from my pond, casting ripples from the lights on the trees and the house. I chose, for choice of beverage, a chilled glass of New Glarus Belgian Red micro brew and put the cigar to my nose for the first time since it arrived 2 weeks ago. There was no telltale ammoniac smell present in younger versions and I hoped this stick had been through its second fermentation. The appearance is dark colorado and slightly soft to the touch with a slightly bumpy capa and a few small veins. The prelight draw tasted strongly of earth and cedar. Now for the crowning moment; I warm the foot and light this beauty with a long cedar stick. From the first draw the notes are spicy and quite heavy and Iam , frankly, pleasantly surprised by pronounced chocolate undertones. Now I am thinking to myself " how much better can this get ". Well it IS complex with nuts and nutmeg joining the flavor parade after the first inch. The strength is reasonably consistent and strong for a 10 year old but with a remarkable smoothness not present in younger SS #2s. The stick burned with a tight gray ash and needed only 1 touchup. The ash fell at a remarkable 2 1/2 inches, attesting to the quality of the roll. Most of the power was released in the first 2/3 of the cigar and the flavors remained consistent but became more creamy in the last 1 1/2 inches. The finish , was,perhaps the longest I have ever experienced and I could still taste the flavors on the palate more than an hour later. As I waited for these to acclimate I only hoped they had been well cared for and FINALLY I would have the experience of a great example of my favorite corona gorda. I was INDEED rewarded and have to say this smoke ranks in the top 5 or 6 I have ever had the pleasure to enjoy. I have to go with the entry from Mark Davis. I found his description so enticing that I was quite envious of him and his ability to have one of these cigars. His description of the chocolate and spice overtones as well as the setting he described smoking it in made me feel like I was there and experiencing the pleasure as he was. Very nice review. Mr. Davis made me feel like I was there, smoking with him. I'm not a big fan of the Punch line, but this review makes me a bit more interested in trying a few more punch vitolas. It was one of the first balmy days of spring in frosty Denmark, and I was sitting on the porch after lunch debating which cigar to go with the gentle breeze and the leafy shadows playing on the grass. I chose a Punch Punch from the humidor - a corona gorda, which is a bit smaller size than I usually prefer. As regards the vitolas, I tend to be tempted by bombast. Large ring sizes, great length. But somehow, it seemed right for the smaller size to echo the small improvements of the thermometer. First of the pleasures, the pre-lighting aroma. None of the dreaded (by me) animal odours, but fresh, crisp, oaky tobacco smells, combined with a tang of liquorice root. Then, the feel. The construction of the cigar was perfect - supple, but not soft, and easy to cut. Then, the sight. Though the wrapper was not entirely free from veins - it was, after all, a cigar leaf, not a printed piece of paper - it was aesthetically pleasing, medium brown, slightly red-tinged. The lighting went well; tight, grayish-white ash formed, and the flavours began. The draw was not exactly loose, but not uptight either. I must confess that I abhor a tight draw on a cigar and its incumbent associations of sucking oatmeal through a straw. The smoke was just right - not great, billowing clouds enveloping me, but a light, bluish veil that was in accordance with the wispy spring clouds above. Taste-wise, the Punch Punch is no heavyweight. It does not knock you over the head with violent sensations, but in so far as a cigar may be said to possess sophistication, this is it. You won't find the sheer force of a Bolivar or the overwhelming earthiness of a Montecristo 2; more of a flowery freshness and a subtle dried-fruit flavour that enlivens the senses instead of deadening them. Think of the smell of balsa wood converted into tobacco taste, and you've about got some of the nuances. All in all, it is refreshing like a tall, cold gin-and-tonic on a hot day, not like a heavy, dark brandy at day's end. As a matter of fact, I smoked it with a cup of cafe latte, but at a later hour I would have preferred it with a mellow, buttery Australian chardonnay, or perhaps - yes! - an American single cask bourbon. As a matter of fact, I think I will do just that tonight So if you are in the mood for a little mozartian massage of the taste buds, there is a cigar for that kind of experience. The Punch Punch. Patty & I got 2 each of the Punch Punch & the Punch Black Prince to test the difference between these very similar vitolas. 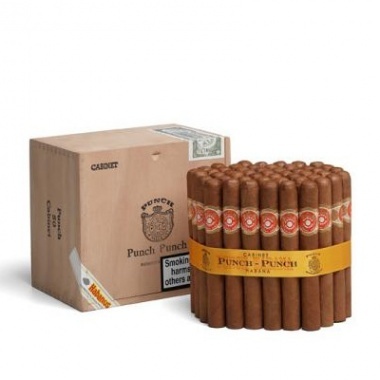 Many folks (myself included) consider the Punch Punch as the stereotypical Cuban cigar. Neither too strong nor too mild, very definite Cuban aroma, nice (but not flawless) construction...these are excellent middle of the road Havanas. The Punch Black Prince (now discontinued) is same size & shape, same band, same price point. These sticks came from M.O. and are above reproach as to authenticity. M. told us that the Black Prince had a slightly lighter shade of wrapper. 2 were easy to differentiate (one very dark & 1 very light, both relative to the others) and the other 2 we chose correctly also (verified by the tasting). These corona gordas (one of my favorite sizes =) present very different profiles considering the outward similarities. We much preferred the Punch Punch. The Black Prince was a bit sharp on the tongue while not providing any of the rich flavor - it was harsh without being full-bodied - reminded me of the H. Upmann Magnum 46 - dry & flat. The Punch Punch were excellent in all regards. The cigars arrived in perfect condition, thanks to the careful packaging job done by the vendor. Still perfectly humidified after the journey, they looked quite inviting, and they smelled good, and I looked forward to enjoying them. They were a 48 ring, by my best estimate, and slightly over five inches in length. I had intended to actually measure them, but I was too eager to smoke the first one, and I was away from home when I smoked the second one, and simply forgot altogether once I got to the last one. I deftly punch-cut the first cigar, and I am sorry to say that I found it to have a very tight draw. I will be the first to admit that I prefer a smoke to have a fairly free draw, so I may be somewhat biased against tighter cigars. I have been smoking cigars for about six years now, and have been a reader of the Newsgroup ASC for about four years. I consider myself to have a moderate knowledge of the cigars, their construction, and smoking technique. I like to be able to have control over the amount of air going through my cigars, and thereby control the intensity of the flavor and the volume of smoke. If a cigar is rolled in a manner that prevents this, it becomes a hindrance to my enjoyment of the experience. I may be in the minority here, but that's the way I have learned to determine whether a cigar is well constructed. Having found a problem with the first cigar, I punched the second, and found it to be tight also. The third cigar, I straight cut and not too surprisingly, found that one to be tight also, though not quite as tight as the other two. I decided to let them rest for several days before attempting to smoke them. After eight or ten days, I retrieved the cigars from my "conditioning humidor". I call it that because it has a poor seal and runs at about 60% humidity. I find that to be perfect for preparing cigars to be smoked. Also, tight cigars sometimes loosen up a bit if allowed to dry out ever so slightly. To my disappointment, the cigars seemed to be just as tight as before. I chose the tightest cigar to review first. The wrapper was medium to light brown. It did not have the normal distinctive reddish brown hue of a Cuban cigar, so I was unsure of its origin, although the construction and aroma said "Cuba". The color of the wrapper leaf became quite light, a dark amber color, about two or three centimeters from the cap. The entire cigar was significantly lighter than the other two. The appearance of the cigar, other than the multi-colored wrapper, was fairly good. The wrapper had some medium veins in it, but the cigar had a smooth overall appearance. The cap was good; I wouldn't say the stick was especially impressive, just good. Looking at the foot, the cigar seemed to have the appropriate interior construction, with the binder being just a shade or two lighter in color than the filler. The cigar was perfectly round along its length, and had no lumps or flat spots. The cigar is tight. Not excruciatingly so, but more than enough to provide more resistance to airflow that I would want. Many cigars that are only slightly tight smoke quite reasonably well. The pre-light aroma was light and airy, and had no bite or ammonia characteristics, indicating a mild, well-aged cigar. I poured a tall glass of my favorite beverage for accompanying a fine cigar: Cold, clear water, and took a seat in my favorite chair. The initial burn was not especially even, but not especially uneven either. Had I not been reviewing the cigar, I wouldn't have thought one way or the other about it. At one point, one side of the wrapper did not burn for a few centimeters. This appeared to be due to a gap between the wrapper and the binder that had developed. Otherwise there was a thick black line where the wrapper was burning. This would not be a favorable indication. The ash was rather dark gray and tiger-striped with dark bands, indicating the hard drawing on the cigar. I knocked the first ash off prematurely after smoking about three centimeters, and there was noticeable coning inside. The cone was somewhat pointed and about as long as the cigar was wide. I allowed the cigar to burn without drawing on it for about two minutes or more, so the inside and the outside would have a chance to equalize. Due to the tight draw, the cigar was very bitter. There was little in the way of regular cigar flavors to be had. If I double-puffed very hard, I was able to coax out some of the wonderful golden, or amber, leathery flavor I am accustomed to, but that was overshadowed by the bitterness and undesirable flavors of silt and charcoal. If I had to guess, I would say that this would normally be a mild-to-medium, sweet-tasting Cuban cigar. However, in this case, I abandoned the cigar at about the halfway point. A few days later, I selected another of the cigars from the conditioning box. I went to The Board Room (my local cigar lounge) and asked one of my smoking buddies to sample the draw on the cigar, just to make sure that I am not completely out of my tree. After a cursory glance, he said that the cigar is "a Cubano". He then tested the draw and announced that it was indeed a tight cigar. I was somewhat relieved at that point, to find that I am only partially out of my tree. I purchased a bottle of Iced Tea from the liquor store next door, and found a plush chair in which to attempt to smoke my cigar. The wrapper was slightly darker than the first one, and had ever so slightly, the more reddish cast I associate with Cuban cigars. The color was even, without the lighter areas that Cigar Number One had. The construction was good, but the cigar seemed hard. No surprise there. The cigar lit well and the burn was even from the start. The black burn line was narrower than on the first cigar, though not the thin pencil line I would have hoped for. The ash was a more medium gray and much more even in color than on the first cigar. I let the first ash stay on until it dropped off naturally after some three centimeters or more. The ash did not fall apart when it hit my lap; rather, it stayed intact. Still, the draw was impossible. I was determined to get good flavor out of this cigar, and by sucking very hard and long, quickly blowing out the smoke and sucking very hard again, I was able to get a taste of what this cigar could be. There was a dark honey sweetness, or maybe a caramel flavor in the foreground, that made its way through the bitter charcoal overtones. In addition, there was a metallic pencil lead flavor at some times, and at other times, soil and silt. Some persistence would occasionally yield faint leather and what I call the characteristic "golden", or "amber" flavor that sets fine Cuban cigars apart from all others. Given the caramel, and the leather, and distinctive "Cuban" flavor, I am positive that this would be an outstanding cigar if I could ever get any amount of air through it. I drank quite a bit of tea, in order to wash away the acrid, bitter taste of charcoal, lead, and dirt. I persisted for a while, trying to relish the delicate sweetness and complexity of this cigar, but I had to quit when other occupants of the lounge became distressed at the sight of my bulging eyes and my face turning red. Unfortunately, I came down with a terrible cold, and was unable to smoke for several days. My palate returned some ten days after my symptoms subsided, so I retrieved the third and, thankfully, final cigar from the humidor. I was determined to enjoy at least one of these cigars, so that I could give a positive review and not be banished from society. This was the least tightly rolled cigar of the lot. I re-cut it a few millimeters down from where I had cut it before, just to try and improve the draw. To further enhance the possibility of a favorable experience, I poked a nine-inch hatpin down the center of the cigar about ten times. This is not easy to do, but I felt that I should give this project by best effort. Poured myself a big glass of ice water and settled into a nice chair and lit up. It was obvious that this smoke was going to be marginally better than the first two, partly because the draw was just a little bit better, and partly because the muscles I use for sucking are getting stronger. (Don't even GO there!) After a few minutes, the wrapper split, leaving a three-centimeter gash toward the foot. This did not seem to affect the smoking of the cigar but went a long way toward proving that these cigars really are overstuffed, and I'm not crazy. Once past the split, I was able to assess the burn characteristics. The burn was uneven, but consistent. Wavy, if you will. After dropping ash, I could see that the interior was burning much better than with the previous cigars. There was no cone this time, just a gently rounded coal, just the way I like it. The ash was an attractive light gray, with tiger stripes again, in the same wavy pattern as the uneven burn. The inside of the ash was a little darker, maybe a medium gray, and it all held together nicely. Before the next ash dropped off, I noticed that it was amazingly straight-sided, despite the wavy burn of the wrapper. Kinda cool, actually. I wish I could say the same for the flavor. There was more leather and caramel this time with that sweetness in the foreground, and I was actually enjoying this cigar, comparatively speaking. However, the bitterness, the charcoal, the pencil lead, and the metal were all still there. I was forced to imagine the potential of this cigar, rather than actually enjoying it. Conclusion: I am quite sure that these are fine cigars, under normal circumstances. The construction was good enough, and there is enough evidence to support my opinion that they would provide a wonderful smoke if it weren't for the problematic draw. I would certainly give them another try; they definitely have the sweetness and delicate complexity that I look for in a cigar. The first cigar was "tested" immediately after receiving them. Very nice wrapper and tight. The initial draw was somewhat easy, easier than I expected. Tastes of caramel with hints of vanilla. Absolutely no bitterness, very little after taste, but loads of flavor. First couple of minutes, waves of mild flavor, then the intensity of the flavor began. Mixed with a flavors from my childhood of cinnamon sticks, the caramel flavor was exquisite. The ash was medium gray. A runner began to develop about half inch down. Definitely over-humidifed, but I expected this; this baby came a long way. One inch down the intensity leveled off. Looks like the runner problem is under control. Popcorn, yes popcorn! That's what I'm tasting. My endorphins just kicked in. (Can't wait for the butter!) Just under a third of the way down this cigar began to mellow and smoke like a well aged cuban. Very intense flavor; mild to medium body. Nice cigar that started off a little reckless. All right, the second cigar has been in the humidor now for about two weeks. Has a little more oil sheen to it. First five minutes this is very robust and smooth. Strong hints of chocolate. This one has a lighter ash than the first. Burns very even. This is an extremely compelling cigar. About an inch down the flavor has become somewhat woody with that same cinnamon overtones from the first cigar. This cigar has come into its own now, flavor and intensity are very consistent; nothing to do except kick back and enjoy the moment. The cigar is now well past half way, with the same ash! Guess its time to drop it. Two thirds down, the moment is fading. I must say I will miss this one, but definitely look forward to next week and the finale of this trio. Ah, the final installment! This is the third and sadly, the last of the trio I was sent for tasting. This last cigar is just as gorgeous if not more so than the previous two. Wonderfully smooth from the beginning with an aroma that I wish could be put on a scratch-n-sniff card! The flavor of this cigar is one that standards should be set from. The burn of the cigar is straight up along with the medium gray of the ash. In all honesty, I knew this one would be the best of the lot. It has the culmination of flavors if the first two, along with its own characteristics. Hints of a woody taste with strides of toasted bread. It is hard to judge a cigar when one like this is to be enjoyed. Half way through this cigar, it is really hard to find a flaw, but it had one. It went out; discovered a underlap of tobacco that created a hole in the middle of the cigar. Handmade, I love it! Good to the last drop as they say, this was a good cigar. I have truly enjoyed all three but this has to be the best. All were box pressed and a tad salty. All exhibited typical cuban construction; smooth wrapper, oily sheen, and that one-of-a-kind aroma! Smoke these after a full lunch or light dinner. These are definitely worth a try. Would I buy them? You bet, without a doubt! I feel, strictly on a personal preference, that 6-12 months in the humidor would bring 10's across the board. Enjoy! These are my tasting notes for the 3 Punch Punch cigars which were sent to me. They arrived 2 weeks ago and I've been on a business trip. I waited until returning home to sample them at my leisure in an environment in which I'm used to smoking. I smoke while enjoying different beverages, so I tried each cigar while having a different drink. Cigar #1 was smoked while drinking a couple of shots of Cardhu single malt. The cigar measured 143mm X 46. It had a nice Colorado wrapper and was nicely smooth with no veins. The cap on this cigar was broken when received, although this had no affect on the cigar, since the broken cap was removed prior to smoking. The construction of the cigar was very nice; it had a nice roll and there were no soft spots. It gave ever so slightly when squeezed. There was very little pre-light aroma to the cigar. The pre-light draw was slightly tight, but not overly so. Within the first few puffs after lighting, the draw opened up and the cigar yielded nice, thick smoke, and plenty of it. The cigar burned evenly, with only an occasional minor touch up to keep it even. The ash was dark gray, solid and held on very well. I had to break it off on the edge of the ashtray to remove it. The aroma was nice, with some spice, but quite ordinary. To me, the flavor was what I would call woody. After about a third of the cigar was gone, the flavor changed to somewhat more cedar flavors, but still woody. The cigar was spicy/peppery throughout its length and had an average finish. The strength was medium. Overall, this cigar was a very nice cigar with lots of smoke, quite enjoyable, but not outstanding. Cigar #2 was smoked while drinking a Coca Cola. This cigar measured 143mm X 45. It also had a broken cap which didn't affect the cigar. It, too, was silky smooth with a slight oily sheen and no noticeable veining. It had the same Colorado wrapper as the first cigar. Again, the construction was quite good with no soft spots. The pre-light aroma was unremarkable and reminded me of tobacco (duh!) and the draw was just slightly tight again. When lit, after the first few minutes, the draw opened up nicely again and the cigar produced enough smoke to satisfy anyone. This cigar had a slight tunneling problem most of the burn, but thanks to the lighter, it was easily corrected. The ash was dark gray and solid, but slightly flaky compared to the first cigar. The aroma was spicy and lively. The cigar again started out tasting woody to me with some cedar notes creeping in after the first inch or so and becoming more pronounced halfway through the cigar. Again, I'd also have to call this a somewhat spicy or peppery cigar, although in a very appealing way. The finish was average and the strength was medium. My impression of this cigar was enjoyable, more so than the first one, although I'm not sure why. I nubbed this one! Cigar #3 was smoked while drinking coffee. This cigar measure 143mm X 43. I'm not sure why there was a different ring to each of these cigars. They were all dead on for length, but did vary somewhat in their rings. I've never really measured the cigars I've smoked before so this might be quite normal.The cigar's appearance was similar to the other two but the cap was perfect on this one. Again, there were no veins, a slightly oily sheen, a nice roll, not much pre-light aroma and no soft spots. This cigar was also a tad tight on the pre-light draw but opened up shortly after lighting, producing good amounts of slightly peppery smelling smoke. The ash was again dark gray and firm. As I expected, the unremarkable, early woodiness opened up to a nice cedar note part way through the cigar. The finish was again average along with a medium strength. Again, an enjoyable cigar. I would call this a very enjoyable cigar, although not necessarily an outstanding cigar, appealing to a wide variety of smokers, especially beginners, since it's not an overly strong cigar. On a 1-5 scale, I would rate this a 4. I would call it a well balanced cigar. This would make an excellent, everyday cigar, smokeable at any time during the day, except perhaps after a large meal, at which time a somewhat stronger smoke would appeal to me. Thanks for the opportunity to try these fine cigars.